My younger colleagues often ask me for dissertation advice. How do you keep your research and notes straight? How do you structure and restructure your argument? How do you motivate yourself to write on a regular basis? How do you do all of this without losing your precious sanity? Regardless of which question I am being asked, my response almost always involves a common refrain: Scrivener. Developed initially for novelists and other creative types, Scrivener is writing software that has earned quite the following in the academic community. In this post I would like to outline why I chose to use it while writing my dissertation, why I am glad that I did, and what I would do differently if I had to do it all over again. Why did I choose Scrivener initially? A fellow graduate student introduced me to Scrivener years ago. I will confess that while he was explaining several of its features, I found myself wondering why he was so excited. How could this software be useful to ME, someone responsible for writing serious and scholarly things? I already had Microsoft Word, and it had brought me through college and two masters degrees, right? So what, I asked, was the point? I concluded (hastily, in hindsight) that it should be placed alongside font selection as one more way that graduate students could procrastinate while still appearing productive. Support this site by purchasing Scrivener for Mac via this link! About two years later and after several other encounters with devotees of the software, I passed my comprehensive exams and jumped headfirst into the dissertation. And because I was a graduate student, I also began to search for clever and efficient ways to procrastinate: I started printing out test pages to determine which font I was going to use; I began experimenting with alternative/therapeutic lighting schemes and furniture/book arrangements in my study; I discovered that not all note-taking paper is created equal; and I learned that Microsoft Word is neither the only nor the best word processor for long, book-length documents. Realizing that I was deceiving myself into thinking that such pursuits were good uses of my precious time, I devoted one day—and one day only—to figuring out which font, paper, and word processing software I was going to use. I downloaded a few options to start with: Nisus, Mellel, Bean, LaTex (which I never did figure out). After toying around with these a bit, I remembered Scrivener. I’m not sure why, but when I opened up the software for the first time something about it just clicked with me. Perhaps it was because I found the programs I had looked at thus far to be downright clunky, but Scrivener’s user interface struck me immediately as clean, well organized, and intuitive in many ways. After about an hour with it I was hooked; I took a few of the tutorials and had a detailed outline set up in no time. So yes—ironically, what began as an attempt to procrastinate ended up yielding what I now consider to be the single most important tool in my toolbox. Why am I glad that I chose Scrivener? Anyone who uses Scrivener on a regular basis has an opinion regarding its most useful components. Below are three of the features of Scrivener that I found to be the most helpful in the process of writing a dissertation. The list is not intended to be exhaustive. 1) Outlining — One of the things that takes a bit of getting used to in Scrivener is the “binder” that is situated to the left of the text input window. The binder is divided initially into three sections: draft, research, and trash. The draft and research sections allow you to create outlines to guide you in the process of writing and research. These can be about as detailed or broad as you want. The outlines you create are actually systems of tiered text files. So, let’s say you make an outline for “Chapter 1.” Under this broad rubric you construct five headings, and under each of these headings you create three subheadings. The benefit of this—aside from more or less requiring you to outline your project before you start writing it—is that the system of text files allows you to skip quickly from one section to another, which helps move you away from thinking of the whole thing in strictly linear terms. Most of us don’t think in straight lines from start to finish, yet the expectation (for whatever reason) is that we need to write this way. No wonder the experience of staring at a blank page is such a common one! Scrivener’s outlining feature certainly does not eliminate writer’s block, but it does remind you that your larger project is made up of individual components, and that you don’t necessarily have to work on them in order. In fact, the whole thing may move along more quickly if you don’t work on them in order! Support this site by purchasing Scrivener via this link! 2) Automatic Writing Goals — If you know roughly how long your project should be, and you know when you want to have it completed by, Scrivener can help you figure out how many words per day you need to write every day in order to reach your goal on time. I am aware of no other program on the market that has a feature like this. I knew that my dissertation needed to be around 65,000 words, not including footnotes, and I also knew that I wanted to finish writing it in one year (that didn’t happen, but that’s a story for another day). So I opened up Project Targets, entered my figures, told Scrivener to “automatically calculate from draft deadline,” selected the days on which I planned to write, and that’s it. Turns out that if you want to write 65,000 words in one year, and you only want to write on Mondays, Wednesdays, and Fridays, you can accomplish your goal by writing 414 words per day. If you set a more aggressive schedule, i.e., write on every day of the work week, that figure drops to 249 words per day. Either of these is entirely manageable and a lot easier than sitting down every day not knowing if you are ahead or behind. If you get inspired one day and write more than you are supposed to, Scrivener will update your goals so that you will write less the next time. Alternately, if you take a week off of writing, Scrivener will have you write a few more words to catch up. This feature was valuable to me because it showed me that the only way to complete long writing projects is one piece at a time. And it reminded me throughout the process that regardless of how small an accomplishment it seemed at the time, writing 400 words was in fact bringing me closer to my ultimate goal, namely, finishing. 3) Design and Stability — One of the first things that really struck me about Scrivener was just how smart the layout is. It’s clear that the software was designed, from start to finish, by people who could imagine themselves using it on a regular basis. Nearly every aspect of the user interface, from the layout of the toolbar to the color of your backgrounds, can be easily customized to fit your own needs and preferences.Like any software, there are some learning curves. But if you are willing to spend a little bit of time working through the tutorials that come packaged with it, you will figure things out quickly. 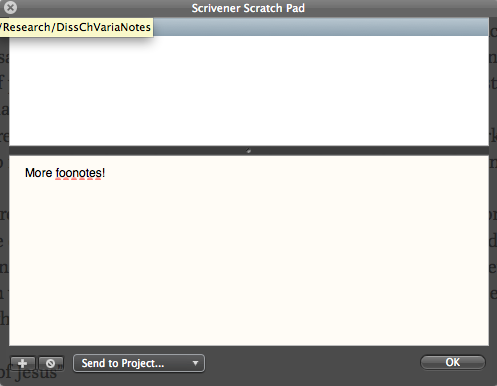 One final point of praise, related to design, is that Scrivener is a remarkably stable program. In the two years that I spent using it to write my dissertation, it NEVER CRASHED ONCE. Anyone who uses Word will marvel at that last sentence. Go ahead. Marvel. I imagine there are ways to crash Scrivener—the point is that you are going to have to work at it. Even if you did crash it, however, Scrivener automatically saves your work every two seconds. So even in the unlikely event that you throw more at it than it can catch, odds are you will lose maybe a total of five words. By now you can tell that I’m a huge fan of this software. I could certainly have written a dissertation without it, but the task would have been much more arduous. To close out this post, I thought it might be helpful to reflect on what I would do differently next time. While I will never (ever) have to write another dissertation, I have recently started work on another project in Scrivener that should keep me entertained for at least the next year. So what am I doing differently now? 1) Use the research section of the binder more — Scrivener is first and foremost a writing tool. But it also sports a number of features that can help you organize the nuts and bolts of your project. One of these is the research section of the binder (mentioned above). This section can support pretty much any sort of file that you can imagine. In the project I’m working on currently I am keeping images and article .pdfs in the research section as well as outlines and notes. Scrivener’s split screen mode makes switching between your writing window and .pdf viewer unnecessary; you can have both open at once. While I am still using bibliography software for citations, I’ve found that using the research section is helping me stay more organized. 2) Take more snapshots — A snapshot enables you to save a version of your project that you can later go back and compare against newer versions. It is similar in many ways to Word’s “track changes” feature, though more smoothly executed (surprised?). I knew that this feature existed when I started using Scrivener, but I didn’t start using it until I was finishing the final chapter and beginning to edit. To be sure, the editing phase is the point at which snapshots are most valuable; if you find that you were a bit too zealous in your cutting, you can always go back and retrieve what you have chopped out. In the project I am working on right now, the first thing I do EVERY TIME I open the file is take a snapshot. It takes seconds, and I have peace of mind knowing that there is a limit to how bad I can screw things up if I’m having a bad/off day. 3) Use the scratch pad. This is a feature that I rarely spend time telling others about because I don’t think all that many people would understand the idea behind it. The scratch pad is tucked away in Scrivener’s “window” menu (I think it is also possible to assign a keyboard shortcut that will open it). When you select it, a little text entry window appears. In this window you can do some free writing, record a stray thought that may have entered your mind, or sketch an idea you have about reorganizing a chapter, etc. You could use it to write out a grocery list if you want. What the scratch pad does is give you a blank document quickly, before you have to waste a whole lot of time deciding where to type whatever might be on your mind. It’s akin in many ways to keeping an index card and a pen with you at all times, just in case something pops into your mind and you don’t want to forget it. What makes the scratch pad different from all other text entry windows (as I understand things) is that the text you enter in it isn’t really linked to any project in particular. If you have a Scrivener file set up for your dissertation, another for your blog, and another for, say, teaching resources, all of these would share a scratch pad. So, if you are in your dissertation and open the scratch pad to make a few notes, those notes will be there when you open up the scratch pad while you are working on your blog. I use this feature when I am in the middle of writing for one project but have a thought related to another; the scratch pad lets me record that thought quickly without worrying about getting too sidetracked or forgetting where I put the note to myself. At the end of the day, being a successful writer, i.e., completing what you set out to write without losing your mind, is as much about having the determination to sit in one place for long periods of time as it is about anything else. But coupling this determination with the right tools can make your task a little more pleasant. If you found this post helpful and are considering purchasing Scrivener, please consider doing so through the following link! I had a very similar experience. Having just finished my doctoral thesis, I can’t even imagine not using scrivener to write it. It made the experience, for me, enjoyable and helped maintain my motivation for consistent writing. I also would use the features you’ve suggested in a different way if I began again. I can’t recommend this program enough and I now use it for every writing project I work on. Thanks for dropping by, Bronwen! I never plan on doing a dissertation, but it’s always interesting to see what Academic types find useful in Scrivener… mostly, it’s the same as what fiction writers like. I should probably start using the scratchpad more often; it’s a handy place to toss ideas that threaten to distract me from what I’m trying to write. Since you’re a big fan of snapshots, I thought I’d point you to a couple of settings that make them more convenient; First, there’s the “Take snapshots … on manual save” setting in Scrivener->Preferences->General pane, under the “Saving” section. Every invocation of File->Save or CMD-S will create snapshots of all of the documents changed since you opened the project that day (or week… however long you keep it open for). The other thing I find useful is the toolbar icon for titled snapshots. Go to View->Customize Toolbar to add that handy button to the top of your window, which will prompt you for a title for your snapshot when you invoke the function. This is great! I am in the writing phase right now and I’m working with Scrivener and Bookends. Running across your blog has been an encouragement that I made the right decision. The only think I’ve been wondering about is how to setup my page bibliography, based on the citations in the various sections of my project. Any thoughts? Glad you liked the post! Scrivener and Bookends is quite the pair — I still use them together. I’m not sure I understand your question re: the bibliography. Bookends will automatically generate a works cited at the end of your “final” document, i.e., the one that you will export to Word (or whatever) to do your final formatting. Unfortunately, Bookends can’t generate a bibliography of any sort while your document is in Scrivener — you have to export it in order to “scan” the temporary citation holders and thus generate a works cited. Maybe give me a few more details of what you’re trying to do and I can let you know if I have any tips! I just used Scrivener in the early stages of my Master project. I started sketching out an outline in Index Card, an iPad app which can link to Scrivener. I then used it to do the first few drafts. If my supervisor had had it, I’d have done the later drafts in it too, but thought Word was easier for sharing content. For the bibliography, I used Zotero – I save all my article pdfs to that and then it’s super-easy to generate references in your chosen style. Thanks for the article! Pingback: My PhD technology ‘stack’ – Ph….Done. I am so glad I found your blog post. I am encouraged to continue my dissertation, it’s been a daunting task using Word, but think switching to Scrivener has been the best choice. I love the tips. Do you have a youtube channel, too? I am starting to write my dissertation and trying to finalize a software. I like your blog and especially the tip about scratch pad. It is now located in Tools menu. Glad you like it, and happy to have you! Thank you so much for this post – I hadn’t heard about Scrivener before I stumbled across your blog, and I’ve started using it as a result and it is AMAZING in so many ways. I love the small sections and how I can flit back and forth between sections effortlessly – THANK YOU SO MUCH for bringing it into my life! However, the one thing that is driving me crazy is trying to figure out how to set up footnotes! I’ve googled and searched on youtube, but I can’t find a way of setting up footnotes within Scrivener… what do you do for this? So glad this post has been helpful to you, Katia! Footnotes in Scrivener are simple once you find them. What you’ll need to do is make sure the “Inspector” side pane is open (button for this is in the upper right corner of the mac version – it’s blue). Once the inspector is open, one of the tabs (that looks like a speech bubble) is for footnotes and comments. To footnote a text, highlight the sentence or portion of the sentence you want to footnote and click the little “+fn” in the footnote tab. You won’t see footnote numbers, but you will see large portions of highlighted text – when you export to Word these will turn into footnotes. In my freshman year of university I found it really hard to transition from my high school grading system to doing university course work. If i were to go back to high school and tell myself that i’ll be ordering essays online i’d say i was talking bull, but no. https://digitalessay.net provided me with a solace and a way to get used to the amount of work that my professors gave me. "God has an avenging eye: you will pay the penalty to the mouse army, and not escape" (Ps-Homer, Batrachomyomachia 97-98).